American electric car manufacturers just got a powerful vote of confidence. With tax credits for buying an electric vehicle going away and some of America’s most powerful corporations working hand-in-hand with the fossil fuel industry, it may be hard to fathom electric cars ever overtaking their gas-guzzling counterparts. But in billionaire investor Warren Buffett’s opinion, a proliferation of electric cars is almost inevitable. 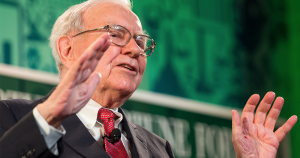 When it comes to how to get to that future, Buffett thinks that American automakers will innovate all on their own — he told CNBC that letting the market run itself without government assistance would get us there faster. Buffett acknowledged and celebrated China’s massive push for ecologically-friendly technology like electric cars during the interview, but maintained that government subsidies won’t be necessary Stateside. Rather, he told CNBC that he thinks that car manufacturers will shift to electric of their own accord.